I’m embracing the launch of Pokémon Go by using this as an opportunity to link Pikachu to biology. Everyone knows the Pokémon lyrics ‘Gotta catch ‘em all!’’ and can relate to this sentiment, especially in the quest to become established in any given career. My rapidly approaching graduation day not only punctuates the end of my undergraduate education but offers a chance to reflect on the past four years at the University of Southampton. Four years ago I wandered up to campus like a lost puppy, now I leave as a fully-fledged Biologist equipped with (hopefully) vast amounts of knowledge and skills arranged like Tetris blocks in my brain. I’m sure that many of you are aware that a degree is no longer enough, we need demonstrable experience, skills and sparkling personality. I can’t help you with the latter but would like to point out some ways that you can boost your CV while simultaneously studying and socialising at university. Some of the commonly requested skills for field biologists, ecologists and any other representation of conservationist are as follows: field experience (ArcGIS, radio telemetry, species identification, camera trapping), analytical skills, networking, project management, and leadership among others listed in a useful paper by Blickley et al. (2013). So where do we get them? The highly sought after but almost impossible to obtain method of gaining area specific experience. As a student, paid employment is essential for some people and often appears in the form of customer service roles, bar work and university open days. However, if you’re lucky you might find some part-time jobs in a relevant area. Ecological consultancy may be an option for those of you with strong survey and identification skills, perhaps towards the later years of your degree. This work is generally seasonal and is likely to involve a lot of late nights looking for our furry flying friends. Further to consultancy, jobs in animal husbandry may be interesting to some people, either looking after domestic or captive wild animals. I have probably painted a rather bleak picture in this area so if anyone has any other ideas it would be great if you could share them in the comments section. Having said that, never underestimate the value of your plain old shelf-stacking job! Some of the most sought after skills also include time management, conflict resolution and the ability to complete tasks, all of while can be demonstrated in any position of employment. In order of appeal, internships may come second to paid employment. They usually span a fixed period during the summer months and can be paid, unpaid or cover travel expenses. This summer I am completing an internship with the Hampshire and Isle of Wight Wildlife Trust on their Non-native Plant Project, which has increased my plant identification skills dramatically. Internships provide an excellent opportunity to learn and ask questions as that is exactly what is expected from you, no question is too stupid when it comes from an intern (except ‘Would you like a tea?’, which usually goes without saying). A placement year can be a great way to learn industry-specific skills (and in some cases earn money) during your time as an undergraduate. I spent twelve months between second and third year of university working for the Game and Wildlife Conservation Trust as a Predation and GIS Research Assistant. 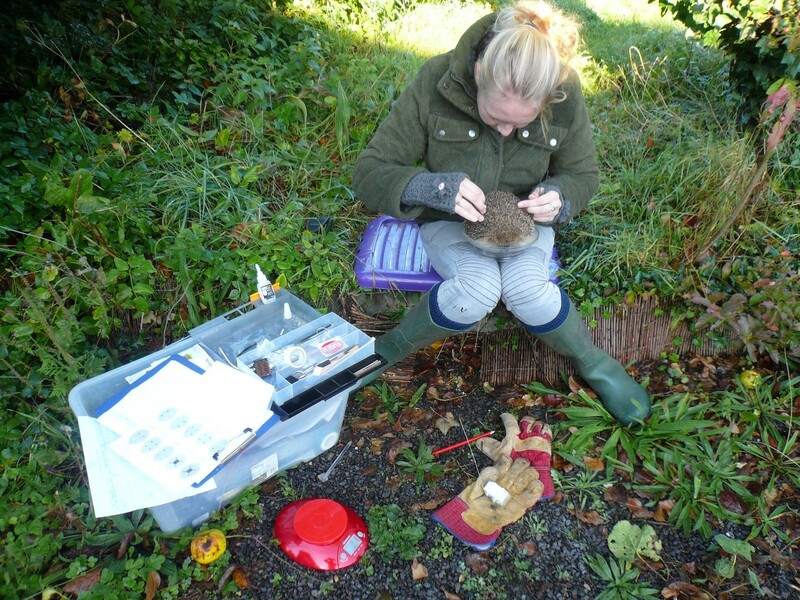 Attaching GPS trackers to hedgehogs. Photo by Mike Short. During my time as a placement student I gained proficiency in ArcGIS (a vital tool for many areas of conservation), animal trapping and tracking skills, in addition to general life and professional skills. Networking was a huge part of my placement year; my supervisors were great and I’m sure they will help me with job applications and references in years to come. The Holy Grail for budding biologists is volunteering! Students and volunteering go hand in hand as organisations appreciate the free help while students accept the privilege. Typically volunteering is part-time over a period of months or even years, often being focused on the less glamorous jobs. Over my four years at university I volunteered in two capacities at Marwell Wildlife; as a biodiversity volunteer I assisted with sand lizard conservation and gibbon behavioural surveys; as a bird volunteer I looked after the birds in the collection including Ralph, wetsuit wearing penguin! I personally love volunteering as for me the sense of achievement and pride when someone calls me a ‘star’ is worth the wellies and poop-scooping. 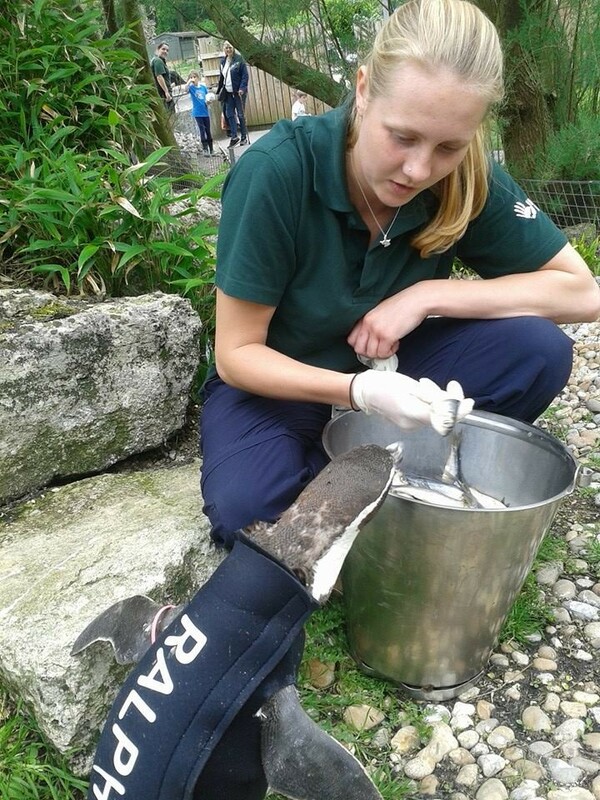 Volunteering is a great way of getting yourself known in the field, I’ve recently been invited back to Marwell to help analyse some data, which I am very excited about! Ralph the wetsuit wearing penguin. Photo by Meg Fieldhouse. Similar to volunteering, work experience is unpaid, however it is often considered to be short-term and full-time. Almost every organisation accepts work experience students in some capacity ranging from two weeks upwards, there is usually a minimum age requirement of 16 due to insurance purposes. I’ve spent time on animal husbandry placements including the New Forest Wildlife Park, Wildlife Heritage Foundation and UK Wolf Conservation Trust. As you can tell I love working with captive animals, not only because I get to see these majestic creatures up close and personal, but also because I believe you can learn a lot about their wild relatives and gain an appreciation of the importance of their conservation as a whole. Field work experience can be harder to come by but it’s always worth asking.. After watching BBC’s Autumn Watch one year I emailed the project coordinator of the Scottish Beaver Trial and secured a month’s work experience observing beavers and carrying out field sign surveys in Scotland! This was one of my favourite placements as it involved rowing onto the Lochs on summer evenings (where we proceeded to get eaten alive by midges) and watching beaver’s emerge from their lodges. You can read about it here! 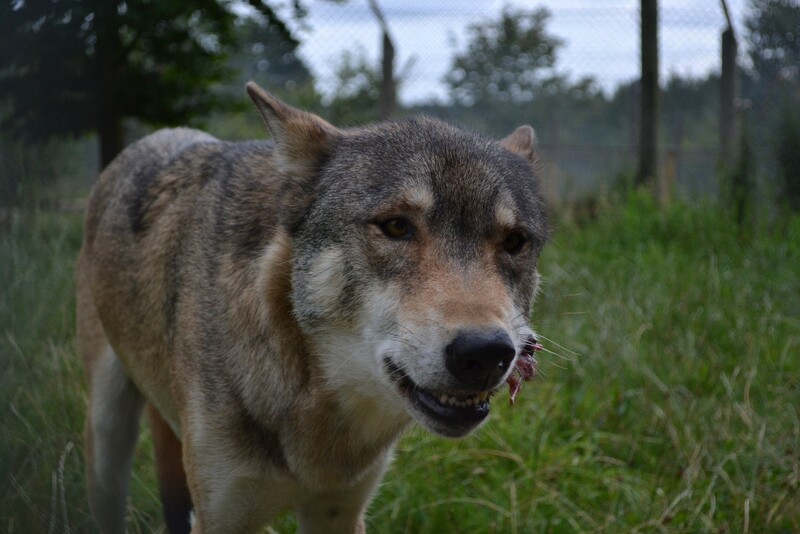 Feeding Torak at the UKWCT. Photo by Sophie May Watts. If you have the money to spare, courses can be a great way to learn lots of skills in a short space of time, some are even free! The Mammal Society run lots of identification and licensing courses that are a cornerstone for ecologists. Additionally have a look at Conservation Training for FREE courses including the IUCN Assessor Course, GIS and REDD+ that you can work through online. If you’re lucky and keep an eye out you may be eligible for bursaries and scholarships as I was for the British Deer Society Deer Stalking Certificate. No deer were harmed in the making of this photograph. Photo by Paul Messenger. Woodcock ringing in the New Forest. Photo by Graham Giddens. When it comes to experience there is something for everyone! Workshops, university societies, conferences and BioBlitz’s. I think I’ve given you some ideas. The long and short of gaining experience is to get out and do it! ‘You said you have a dream.. That dream.. Make it come true! Make your wonderful dream a reality, and it will become your truth! If anyone can, it’s you!’ N, Pokémon inspiring us since the 90’s. 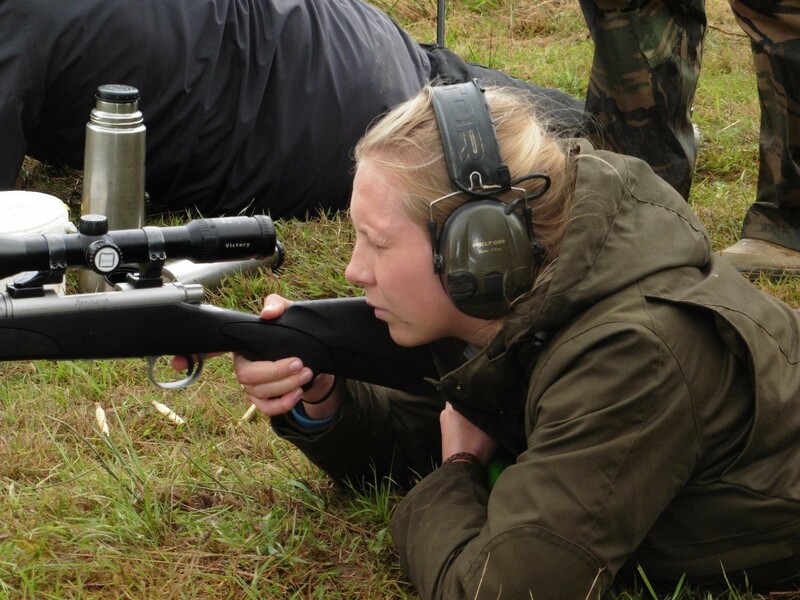 Sophie has graduated from the University of Southampton with a first class in BSc (Hons) Biology and is now studying MSc Wildlife Management and Conservation at the University of Reading. 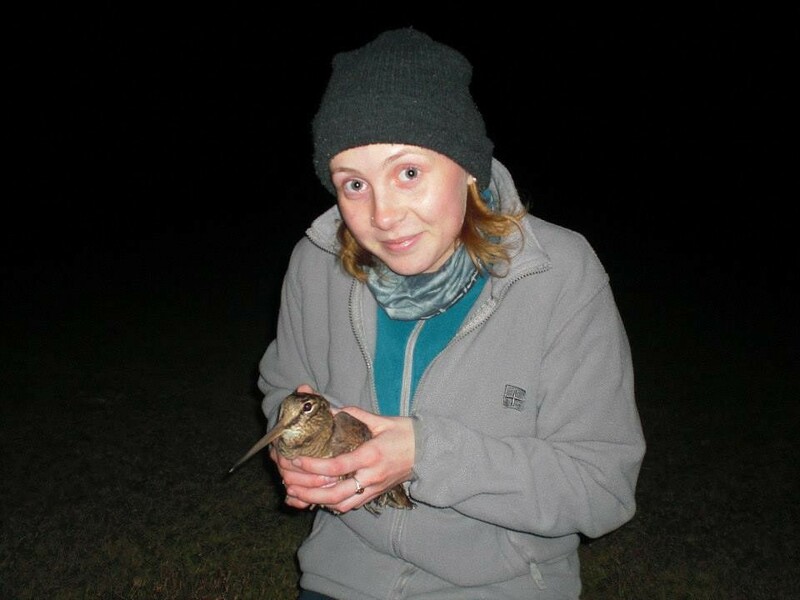 Her animal husbandry experience extends from domestic to big cats with everything in between and she has worked in the field with the Scottish Beaver Trial, Game and Wildlife Conservation Trust and Liga para a Protecção da Natureza. As an aspiring wildlife conservation biologist Sophie is continually seeking opportunities to expand her knowledge and skill base, particularly focusing on mammalian carnivores. Your data will only be used by BioWeb.ie to contact you about the newsletter. It will not be shared with any third parties.